The most clever party favor my son has ever received was from a boy with an architect mom and sculptor dad. Yet the gift was more kitschy than Kahn, more crafty than Chihuly. In other words, it was perfect for a kid: a tiny DIY snow globe encased in a reused baby food jar (he’s a big brother). Read on for instructions on how they made it. 1) FIRST they collected and cleaned the materials: Recycled jars (ours once held pureed carrots), glitter (or hole-punched paper), glycerin (optional) “to make the snow floaty,” waterproof epoxy and an old toy that fits inside the jar. 2) NEXT they glued the toy to the underside of the jar’s lid using the waterproof epoxy and set it aside to dry. A great green option is Eco Glue (“less than 1% VOCs, virtually no hazardous air pollutants, no animal derivatives, excellent water resistance, 100% recyclable packaging”). 3) MOVING ON they added a couple pinches of glitter, filled the jar with water and squirted in a few droppers-full of glycerin (also, some suggest white vinegar or tea tree oil to prevent mold, but even without this ours never molded). It’s best that the water inside the jar overflows when the toy is inserted to reduce the size of the air bubble that will show up. Keep a dish towel handy. 4) LASTLY, glue was placed around the threaded rim of the jar and the lid, with its affixed toy, and the lid was secured into place atop the jar. 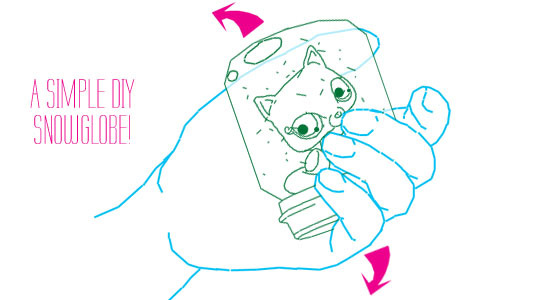 Flip the jar upside down and presto! you’ve got a ‘brand new’ snow globe. My son still takes a moment to shake his snow globe in wonderment every now and then. 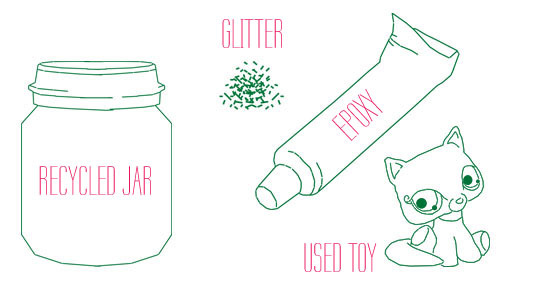 Plus, there are other great DIY ideas for empty baby food jars such as etched spice jars and ‘jaranimals‘. We made these in grade school back in the day. We used plasticine instead of glue, though. You can also use crushed egg shells for the snow, and baby oil or mineral oil instead of water. It makes the "snow" fall slower. Looking forward to starting this one! The most clever party favor my son has ever received was from a boy with an architect mom and sculptor dad. Yet the gift was more kitschy than Kahn, more crafty than Chihuly. In other words, it was perfect for a kid: a tiny DIY snow globe encased in a reused baby food jar (he's a big brother). Read on for instructions on how they made it.